I’m getting lots of spam mails and spam comments lately selling me SEO services promising that I’ll rank at page 1 for my keywords, get more traffic and make more money. Although it’s true that ranking on page 1 in google will get more traffic to my sites, I didn’t like the way I was approached by these SEO marketers. Where did they get my email? Am I interested in the first place? Why should I trust them? Do they even know what I do and write about in this blog? Here are just some examples of so called SEO proposals that I’ve been getting in my inbox and comments. Try to learn from them and see why they didn’t work on a target like myself. I’ve been managing Adcenter PPC campaigns for a while now and getting my skills recognized was the right thing to do. 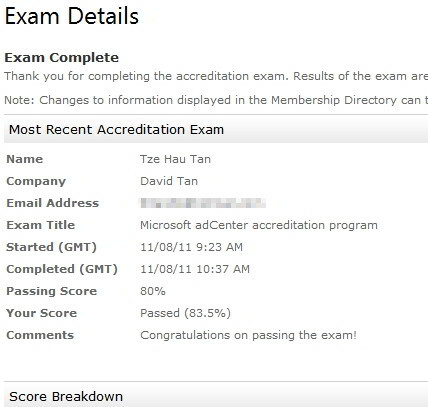 I’ve just taken the Adcenter Accreditation Program test today and here’s the result. Webmasters take note. Did you know that Google provides a tool for you to check if your site is safe for browsing? For example, you can view the diagnostic result for this site returned from Google here. The test result is a good way of telling if your site is safe in the eyes of Google. If your site is reported to contain malicious software or malware, you risk losing traffic from Google and other search engine. It’s also true the other way, if you’ve been losing search engine traffic (due to “Google Panda/Farmer Update” or other reasons), you might want to test your site to see if it’s still safe for browsing. The Google Webspam Report extension allows you to report spammy webpages which ranks high in the google search results but contains questionable content. And in fact, any webpage that appears to be spammy can now be reported easily. Aha, facebook conversion tracking! Although it’s currently still in beta, there’s nothing stopping you from testing it with your facebook campaigns. More info and implementation guidelines can be found in their conversion tracking guide pdf. 3 way linking, also known as ABC linking, is a little more complicated way to setup link exchanges. The benefits of doing this kind of trading is that it is harder for search engine robots to detect the link exchange. It is a well known secret to most webmasters that incoming links is the way to getting listed on the top of Search Engine Results Pages (SERP). Google, amongst others, has realized that webmasters know this, and have started to take into account what kind of links each site has. Is that too much markup for an outgoing link? I’ve been doing this quite often recently and unless someone says this is bad, I’ll just continue doing so. Where To Submit & Ping Your XML Sitemaps? Submitting XML Sitemaps to search engines is one of the most important activity that every webmaster should do to establish web presence and get more search engine traffic such as google, yahoo and msn (bing). The 2009 Year-End Google Zeitgeist (most popular searched terms) list is now out and here are those popular keywords.